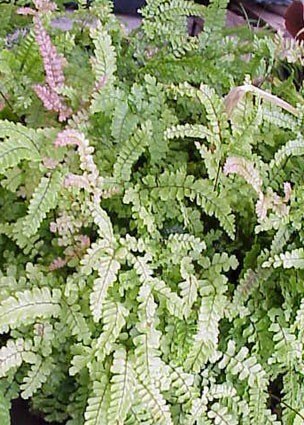 "Australian Maidenhair." Forked horn-like fronds emerge red pink on top of the wiry black stems. Forms an attractive slowly increasing mound. 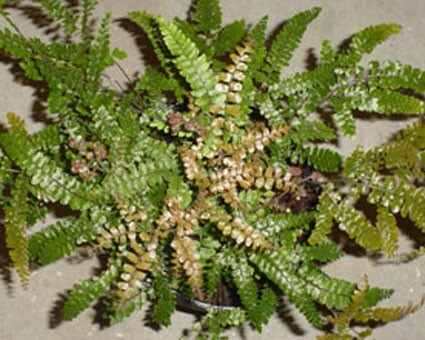 Reliable if kept evenly moist and cool; demands quite bright light and sweet soil to thrive--when you lightly lime the other Adiantums, avoid dusting this species with lime. 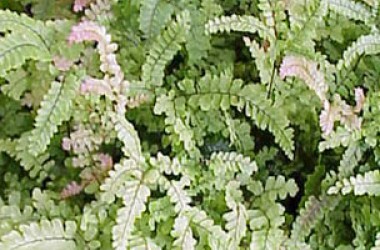 We stock selections of this easily grown but dainty appearing "Maidenhair" with pinkish hued new pinnae. Seems more tolerant of low humidity than other species.